In the previous post, I discussed fence choices for sacrifice areas such as paddocks. Since horses will be in close contact, considerable thought has to be given as to what will be safest. More expensive choices can be considered in smaller areas, verses perimeter fencing which must be done over large areas, may need a more affordable and cheaper fencing alternative. Pipe Fencing ~ A very expensive choice however, a good choice for a property line that runs alongside a busy road. Pipe fencing can be 100 percent pipe or a combination of pipe posts and a top rail of pipe with the rest of the rails being a cheaper product such as cable or rubber. Spacing between posts can be up to 10 feet, but check with your fabricator and installer. White PVC or Hard Vinyl/Plastic fencing ~ I’ve already stated why I am not a fan of this type of fence. It is a favorite though to use along the entrance of a property. IMO this is an expensive, pretty product that requires expensive maintenance and doesn’t contain horses well. Requires an offset electric guard wire and is spaced 8′ apart. Wooden Board fencing ~ High in maintenance since wood warps in weather and ages, as well as if it is painted needing a re-paint. 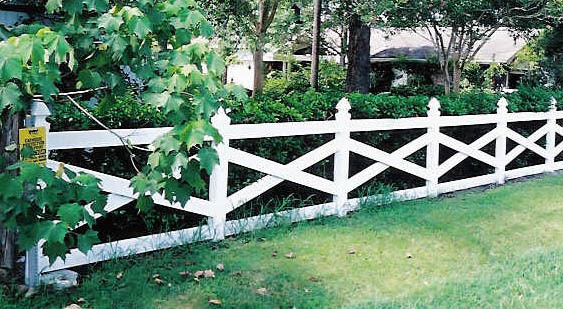 However, board fencing does allow a lot of fun options on styling your fence such as this Crossbuck fence below. 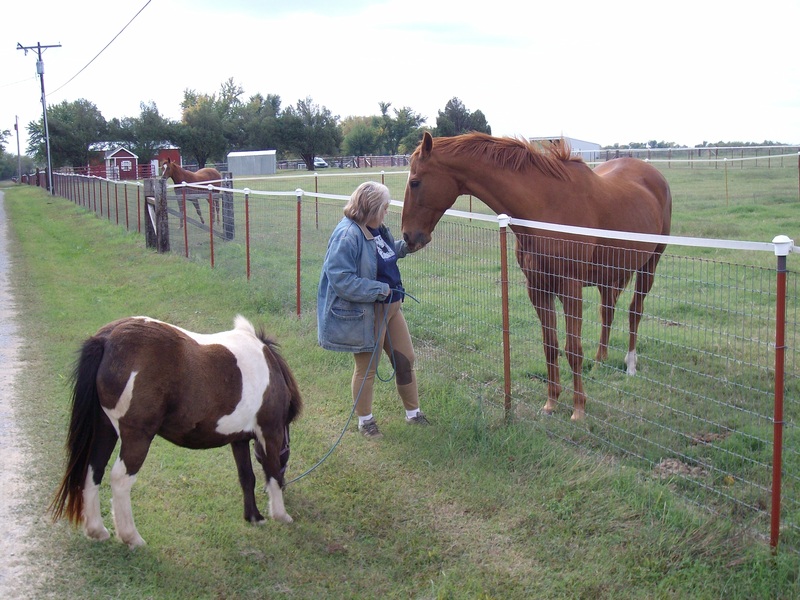 Spacing is 8 feet and an offset electric guard wire needs to be installed to prevent horses leaning on fence. Flexible Vinyl fencing ~ Two companies, RAMM and Centaur are providing a flexible vinyl fencing product that you can use by itself to provide a rail look with less maintenance; these fences do need to be periodically tightened and also need proper installation to work right. The Centaur product can by itself be electrified, or you can add an offset guard wire which I would on any perimeter fence. Color choices are generally black, brown or white. White offsets the boundaries of a property and from the road is the most visible to the passerby. However, if you are in a high moisture area will mildew. I personally prefer black and brown fences as they fade away into the background and the property itself is more visible. They can also be combined with wire filament (cable, plastic, electric rope etc…) for a lower cost. Spacing can be between 8-10 feet depending on the type of fence and install. The big benefit of this fence is that it has flex to it. If a horse hits the fence he won’t be shattering or breaking boards, metal or hard plastic that could potentially injure him. The Centaur product does contain a wire within the rail product. Fastens onto large posts. 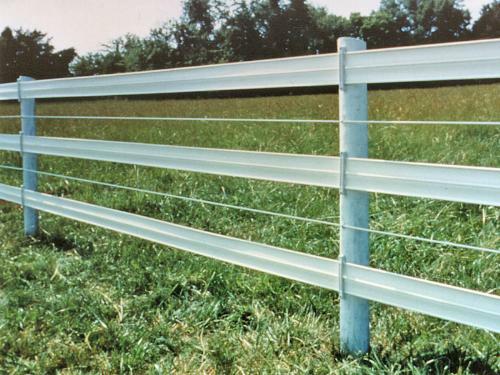 EquiLine filament fencing ~ I’ve seen this fence in action and really like it. 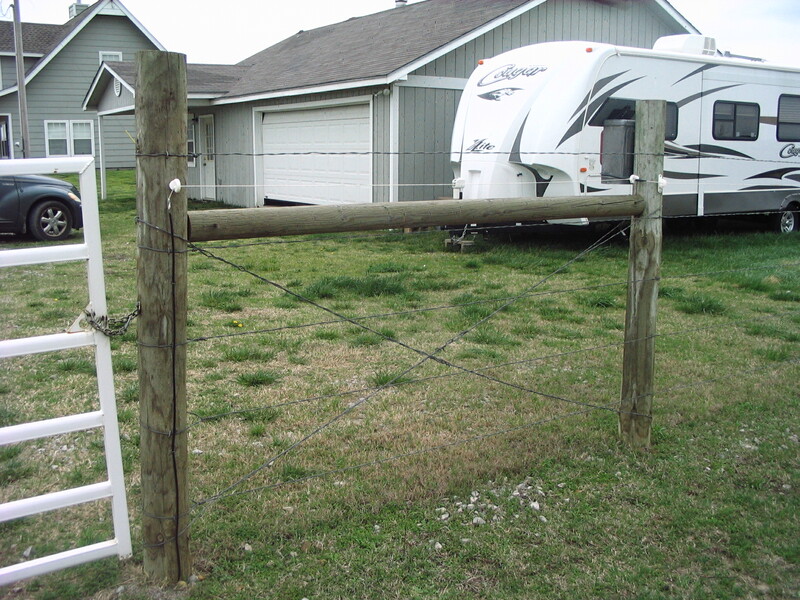 It works well over hilly terrain, bounces when horses hit it, and is a cheaper alternative to the above fence products. It’s a good choice for cross fencing and hilly terrain. However, it is not as cheap as wire and it does need tensioning. It also needs wooden posts as opposed to t-posts so costs more in that area of the installation. Does need to be offset with electric (preferably a black and white rope or tape) to really keep horses off the fence. Can be spaced 10-12 feet apart. Electric Rope and Tape fencing ~ For horse containment, I would never use just electric alone unless you plan on using several rows of it (at LEAST FOUR). While one electric strand as a standalone might keep a cow contained it will not keep a horse safely on your property. I personally prefer a fence that contains a variety of elements – such as a wide tape across the top with rope strands, or EquiLine with an offset electric rope, or wire fencing with offset electric tape, board fence with electric, etc…. Some people like tape and others rope. My personal preference is a black and white rope over tape because I live in a windy part of the U.S. Tape inevitably blows about and gets disconnected here. I also like the contrast of black and white because it makes the rope visible to the horse against green grass or white snow. Horses see in contrasts so you want the fence to show irregardless of the weather. My least favorite electric option is using smooth wire for electric. It’s not visible to the horse and can garrote-cut like any smooth wire. Smooth Wire or Barbed Wire (later not recommended) fencing ~ Smooth wire and t-posts is super cheap and a fast way to construct a fence. It can also be removed (except for corner posts). T-posts can be 8-12 feet apart (realize the farther apart posts are you are sacrificing support). It has the potential for some very nasty injuries. It’s NOT my top choice for the obvious reason that it cuts like a garrot when a horse goes through it and it can be incredibly hard for a horse to see. For example, after putting up this fence, Z almost went through it! I personally prefer the EquiLine but wire can be installed using t-posts so it makes it a cheap, quick and dirty, fence that is favored by many. Remember, the end posts, corner posts, and gate posts should be at least 4×4 posts sunk in concrete with additional bracing between (see the other post about smooth wire for photos). If doing a small line of fence like Pandora’s paddock, use a fence tightener which can be used by hand. For maximum tension, use a tractor to pull tight. To make the wire a bit safer at a previous self-care place, I made it more visible, by spraypainting it with bands of black and white. Since horses see contrasts better then humans, the black and white should help. Shown here (below) you can see the top two lines are already done, and the bottom is still the original silver color. All the t-posts have been capped so no horse will become a shiskabob (this happens when the horse rears at fenceline and comes down on top of a t-post). The plan (above) was to eventually put on two lines of of electric which is held by the plastic topper and the white plastic clip shown midway down. The electric would have been a combo color of white and black rope to increase visibility and respect for the fence. T-posts with Wire Panel Fencing ~ Wire panel fencing comes in rolls and is attached to wooden end posts and braced along the line with metal t-posts. This is a good choice if you live in an urban area and need to keep dogs out (though they can access the gate area it does restrict their entry point). If you had a foal or were breeding horses, the size of the square would need to prevent foal hooves entering and getting caught (it’s called “no-climb” wire). I’m not sure of the dimesions of the squares on this fence – it may be no climb. T-posts can be installed using a t-post driver. This fits over the top of your t-post and you pull it up, hammering the t-post down into the ground. It takes A LOT OF shoulder strength! A message board thread about putting in t-posts can be found here. I believe those above are spaced about 10 feet apart. I wouldn’t go any wider as your fence will lose stability. These fencelines ended with Railroad Ties used as posts and cross braced, installed by a tractor. You need a machine to pull the fence tight or again it WILL sag. JMO but for our geographical plains area, I would have put rope instead of tape as it blows too much. This fence also works best on flat terrain, not hilly land. Neighbors and roads – where would your horse goes if he escaped? Cross fencing can be more breakable then say road side fencing. Dog problem? Consider panel fencing AND a paintball gun. Value of your animals vs. fencing costs – show barns, boarding stables and expensive horses need to be protected as an investment. Cheaper horses still need protection but property owners may need to do so upon a restricted budget. Consider combination fencing and keep upgrading fencing as the budget allows. Good fencing is never a regret. A dead or severely injured horse is. ALWAYS add electric to any fencing! Some sort of electric is essential with any sort of horse fence. A fence without electric will inevitably get rubbed upon and pushed down. However, for electric to work you MUST check it on a regular basis to insure that it is still carrying a charge, keep brush and grass from contacting the fence along the fenceline as this drains the charge, and make sure you select a charger to power the linear feet of fence you are using -using a charger without the right amount of power leads to a weak fence. If using a solar charger, have a battery back up connected so when you lose the sun for a few days you don’t lose your fence! This entry was posted in Barn Design, fencing & arenas. Bookmark the permalink. 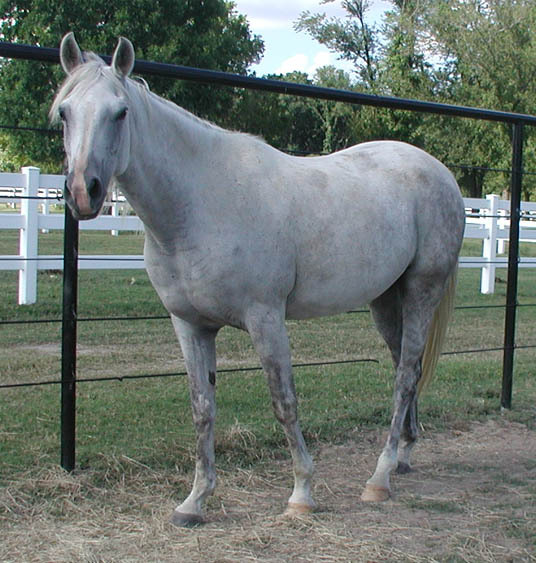 Using vinyl fence clips from EZ On Vinyl helps to keep horses from breaking the vinyl fencing and is easy to install. Plus it gives the aesthetic, pretty look of vinyl fencing. It works great for me!